On Sale Now! Save 5% on the #10 x 1-1/2 Hex Washer Head Metal Roof Screw. 100ct - Self starting/self tapping metal to wood, sheet metal roofing, siding screws with EPDM washer seal. Powder Coated for Corrosion Resistance. For corrugated roofing. (#10 x 1-1/2 Inch) by Generic at In The National Interest. MPN: 35ES#10150G. Hurry! Limited time offer. Offer valid only while supplies last. #10 x 1-1/2'' long Sheet Metal Roofing Screws with hex washer head. These self starting roofing screws come with an EPDM washer already on the screw. #10 x 1-1/2" long Sheet Metal Roofing Screws with hex washer head. These self starting roofing screws come with an EPDM washer already on the screw. The washer will form a seal that will keep your roofing and siding from leaking at the attach points. 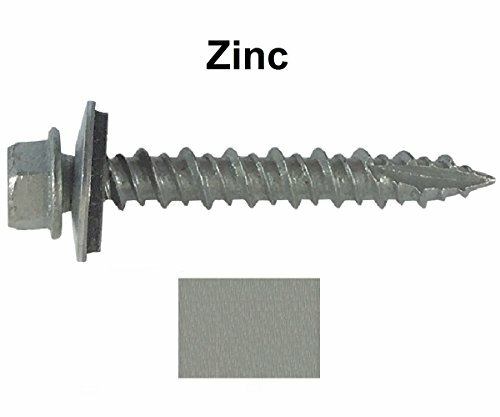 These screws are good for installing roofing and siding on a wide variety of buildings.